(Eight programs on 2 DVDs). 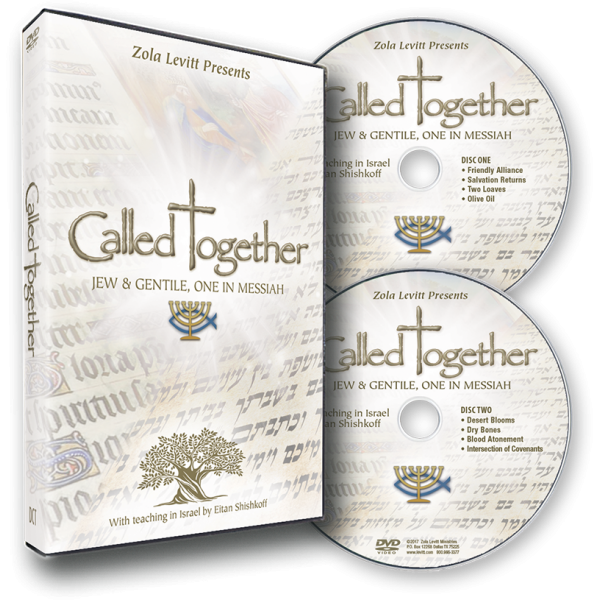 Called Together focuses on how gentile Christians are beginning to recognize their Messianic brothers and sisters (Jewish believers in Jesus/Yeshua) as the natural olive branch referred to by Paul in Romans 11. The Lord calls us to work together to bring the Messiah to the lost and especially to the lost sheep of the House of Israel. From the studio, David and Kirsten Hart present these eight programs of Bible teaching that feature “Our Man in Haifa” Eitan Shishkoff, location reports from Chaim Malespin, brief Hebrew lessons from Diana Frenkel, and interviews with Christian lovers of Israel. Guest analyst Dr. Jeffrey Seif helps us apply these teachings to our lives. Guest teacher Eitan Shishkoff (“Our Man in Haifa”) points out that King Solomon’s help from gentile King Hiram in building the Temple foreshadows God’s salvation plan. Messianic evangelist Jacob Damkani reminds us that the Gospel originated with the Jews. Chaim Malespin welcomes springtime in Jerusalem, Diana Frenkel teaches us how to say “Father” in Hebrew, and guest analyst Dr. Jeffrey Seif talks with David and Kirsten. The Harts sing a song written by Zola Levitt. Eitan reminds us that Israel was the “messenger light” to the gentiles; now gentiles take that Gospel message back to where it began. Importer of humanitarian aid Jim Schutz shows how gentile Believers reflect the love of God. An Israeli Jewish man and a Polish Christian woman call us to support the Jewish people. Chaim shows where he was married, and Diana teaches us to say “Jesus” in Hebrew. Jeff Seif discusses applications with David and Kirsten. Messianic Caroline Hyde sings. The Torah’s proclamation that life is in the blood and salvation comes only through blood sacrifice foreshadowed Yeshua’s sacrifice, which made Jew and gentile spiritually equal yet distinct. 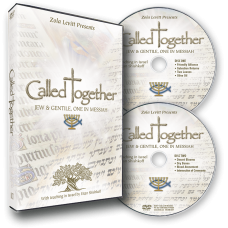 Together, we can celebrate the Biblical feasts in their Messianic fulfillment. Chaim at The Aliyah Return Center aids Jewish immigrants. Diana teaches us how to thank the God of the Armies in Hebrew. David and Kirsten sing “Yeshua,” a song by Zola.